But here too I had to use reference material. I don’t drink beer so I had to walk down the side of the road at least a dozen yards before I found an old Coors can I could copy. Couldn’t use a real one, everything had to be carved out of wood. 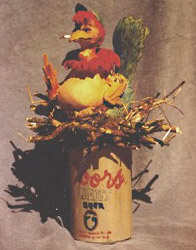 He’s carved for the “Strange and Unusual Birds” contest we had at our carving show back in the mid-90s . Being politically correct wasn’t such an issue back then and anyway I was from South Carolina so it was my duty to poke fun at Georgians whenever possible. a heart with “Mom” in it. and he has , of course, a beer belly. roadside trash and use old beer cans for a foundation so there’s always plenty on hand. Burning and bird carving is fun… don’t take the fun out of your work… enjoy it ! This entry was posted in Orchid's News, woodburning, woodcarving and tagged Bird, woodburning birds, woodcarved bird by Orchid Davis. Bookmark the permalink.